Have students find the opposite pairs in story as you read it. List them on blackboard or chart paper. Have students add more opposites to the list. Have students write their own opposites story. List in order, the places where Plaidypus was lost. Why/how did she lose him? How was he found each time? Endpapers are usually blank. Notice the front and back endpapers of this book--how are they different? Show pictures of Scottish people wearing plaid--and how the plaid represented their family or clan. 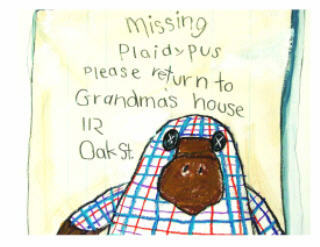 Bring in samples of plaid belonging to certain clans. Have students make a missing poster for something they have lost--what information needs to go on it?